Nagra launches new high-end HD DAC | What Hi-Fi? Swiss high-end hi-fi manufacturer says new Nagra HD DAC is able to "reproduce the purest sound possible"
Nagra Audio has unveiled a new high-definition digital-to-analogue converter that will "reproduce the purest sound possible" – something that it claims digital audio has so far been unable to achieve. According to the Swiss high-end hi-fi manufacturer, musical reproduction loses its "natural and true sound" in the transition between analogue and digital – despite a series of improvements over the years. The company says, however, that the Nagra HD DAC has now bridged that gap as a result of extensive research and development and will "open the musical path to high definition". Andreas Koch of AKDesign worked with Nagra Audio on the digital element of the new DAC, which features circuits that use DSD 2X and claim to operate at a level 128 times greater than that of a traditional CD. 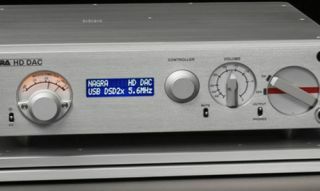 The Nagra HD DAC comes with extensive connection options, including the USB audio input that can accept a signal up to DSD 128 from a PC or Mac. Matthieu Latour of Nagra Audio says: "A new product is considered worthy of appearing in the catalogue once it brings a true improvement in sonic reproduction and the new Nagra HD DAC reaches and surpasses this goal." No word on pricing, though a web search suggests around €15,000. We saw the new products at Audio Lounge in London as part of a £350,000 reference system. Check out our Facebook page for pictures of the system and more Nagra kit.